Stainless Steel RockitRuler New School 34"
Stainless Steel RockitRuler Old School 47"
2 sets of maple veneer with pre-shaped wheel-wells. Advanced foam mold shape with backer board included. Designed to supplement our builder kits, this special Veneer Refill kit has been created to introduce a more advanced, fun and exciting skateboard deck! In this first offering of the Collab Series, Rob Defreitas of Bombora Boards and Roarockit worked together to produce a drop deck that showcases an advanced mold that is not only easy to press with the laser cut veneers but is also a highly functional longboard when complete. The fusion of the drop and rocker gives the rider a lowered cradled feeling making it easier to push and gives more control when sliding. A 5-Pack of veneer sets is also available. This kit can be pressed in the 14 x 47” Thin Air Press bag or larger. Use this Refill Kit with the Builder Kit or TAP bag you already have, as an additional supply of veneer. This build is a more complicated than our other kits as the wheel-well sheets must be laminated separately from the deck sheets then joined together after some sanding. Please allow extra time to complete this build and follow the instructions that come with this kit as they are very different than any of our other build kits. The foam mold, Thin Air Press Bag and pump, edging tool and breather netting are designed to be used for many, many builds. Keep all your reusable kit parts in good working order by following the maintenance tips included with the kit. 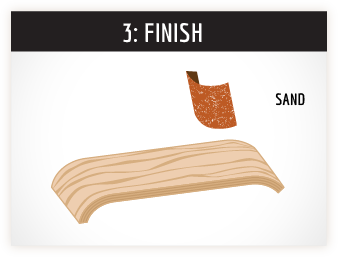 Store unused veneer in a stable environment, away from any heat sources. Protect it from extreme humidity, or lack of it, by wrapping in plastic. Lay veneer flat to prevent warping. Q: Who is Rob Defreitas / Bombora Boards? A: Check him out here! Q: As this kit doesn’t include glue, where do I get it? A: Glue is available from this website, or locally if you can source Titebond III. Q: What else do I need to make a board? 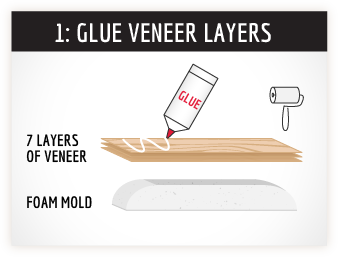 Q: What do I do if my veneer breaks or splits? Q: What else do I need to complete this project? A: If you choose to set your boards up for riding, select grip tape at our checkout. Or shop locally for your grip, hardware (wheels, trucks and bearings). Use the guide holes on the bottom side to drill the truck holes through, using a 3/16” drill bit. And of course, don’t forget to wear your helmet! Q: Can I add a color sheet to my order? A: Yes you can, however as those sheets come as uncut rectangles, you will need to trim that to shape before pressing. For the Pintail kits, we will supply a 42” uncut sheet, as the 48” is too long for the carton. 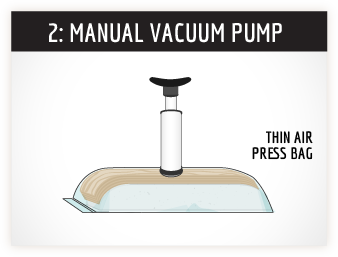 Our patented “Thin Air Press” system is a safe and easy-to-use manual vacuum press system for wood bending projects.